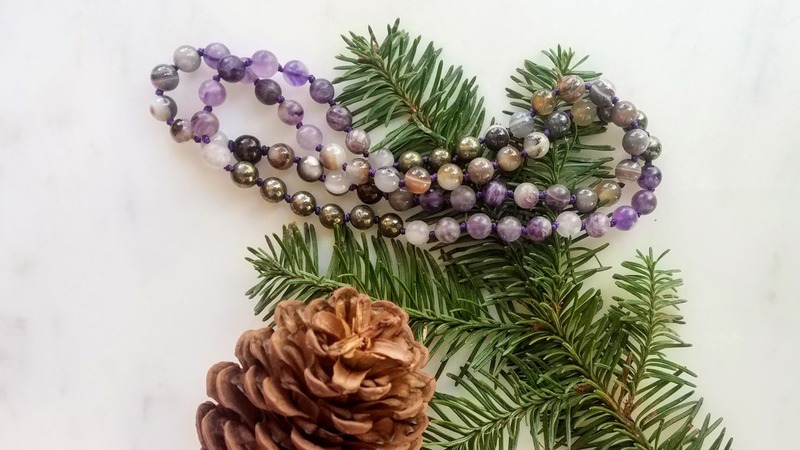 Meditation garland is approximately 26 inches for both men & women to support yoga and meditation practice with 72 beads + 1 wooden "Creator" bead. Vegan friendly hand knotted royal purple cord. 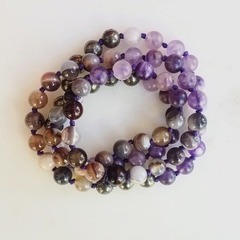 AA amethyst, agate & pyrite 8mm beads. Banded Grey Agate is a stone that offers strength and protection, solid grounding ability, and can help to release negative influences or jealous thoughts. ... A soothing and calming stone, agate works slowly, but brings great strength. Its' multiple layers can bring hidden information to light. Pyrite is a unique protector, drawing energy from the Earth through the physical body and into the aura creating a defensive shield against negative energies, environmental pollutants, emotional attack and physical harm. It also supports one with a spirit of boldness and assertive action when protecting others, the planet, or in standing up for important issues of community. It enhances will power and the ability to see behind facades to what is real.